This species is accepted, and its native range is Russian Far East to China and Japan. Atractylis chinensis f. erosodentata (Koidz.) Hand.-Mazz. Atractylis chinensis var. liatungensis Kitag. Atractylis chinensis f. simplicifolia (Loes.) Hand.-Mazz. Atractylis chinensis f. stapfii (Baroni) Hand.-Mazz. Atractylis lyrata (Siebold & Zucc.) Hand.-Mazz. Atractylis ovata f. amurensis Freyn ex Kom. Atractylis ovata f. lyratifolia Kom. Atractylis ovata f. simplicifolia (Loes.) Kom. Atractylis ovata f. ternata Kom. 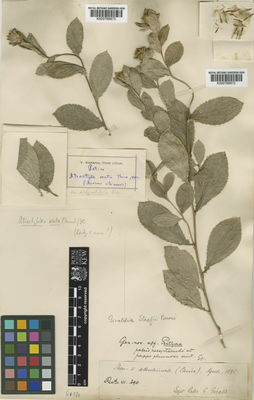 Atractylodes chinensis var. simplicifolia (Loes.) Kitag. Atractylodes japponica var. coriacea Konta & Katsuy. Atractylodes lancea var. chinensis (Bunge) Kitam. Atractylodes lancea var. simplicifolia (Loes.) Kitam. Atractylodes lyrata Siebold & Zucc. Atractylodes lyrata var. ternata (Kom.) Koidz. Ling, Y. & C.Shih in Ling, Y. Et Ge, X. (1987). Compositae. Echinopsidae. Cynareae Flora Reiublicae Popularis Sinicae 78(1): 1-230. Science Press. Schischkin, B.K. & Bobrov, F.G. (eds) (1962). Compositae. Tribes Echinopsideae and Cynareae Flora of the USSR 27: 1-753. Science Publishers, Inc.